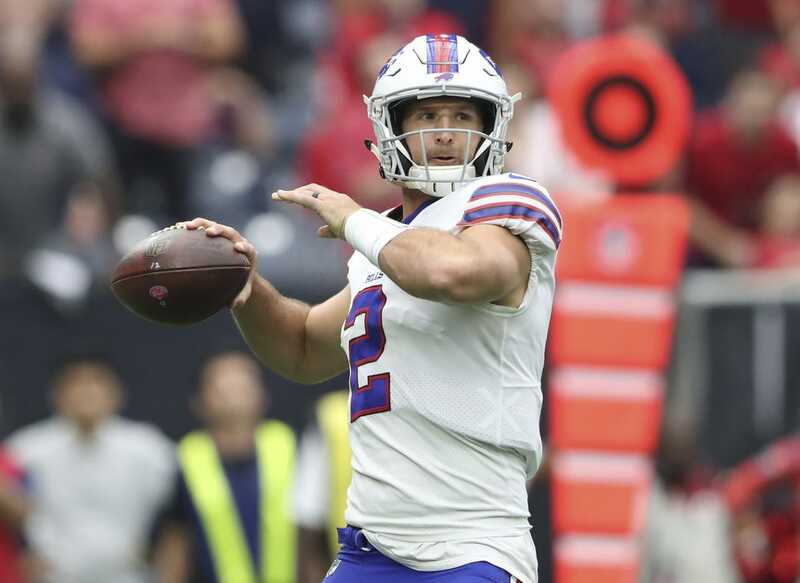 Buffalo Bills: Backup quarterback Nathan Peterman entered the Bills' Week 6 loss to Houston after rookie starter Josh Allen went out with an injury. He threw a touchdown pass to Zay Jones, but then the interception bug bit him again. He threw two, including one that became the game-winning pick-six for the Texans. His career has been defined by interceptions. He threw five in one half last season when he got the starting nod over Tyrod Taylor against the Chargers. In six career games, he has 79 pass attempts with nine interceptions and three touchdowns. "It's tough," he said after the game. "You put everything you have into winning the game. It hurts for my teammates. Everybody out there for 60 minutes, giving it all they had, trying to come in here and help us win and didn't do it today. I'm going to learn from it and take it day-by-day." Head coach Sean McDermott clearly wasn't happy. "Well, we've got to have more respect for the football. I felt he tried to force the football in those situations. You can't do that. You have to take what the defense gives you," McDermott said. Miami Dolphins: Head coach Adam Gase said Monday he had no update on the medical condition of starting quarterback Ryan Tannehill, who missed Sunday's win over the Chicago Bears. Gase wouldn't commit to a timetable and only said Tannehill's right shoulder issue would be addressed on a day-to-day basis. "Nothing's changed," he said. "We're gonna have to wait a couple days and see if he feels any better heading into Wednesday and Thursday. It's just such an unusual situation because last week when we started the week, he was sore, but it got worse as the week went on. That's why we found ourselves in a position that we weren't really thinking we were gonna be in. Normally anytime he's been banged up or had some kind of injury, he's always progressed positively. That's why we thought we'd probably get the same thing. That didn't happen." Backup quarterback Brock Osweiler led the Dolphins in Tannehill's absence. New England Patriots: When Kansas City's Tyreek Hill scored on a 75-yard touchdown late in the fourth quarter against the Patriots Sunday night, he wound up face-to-face with some New England fans in the stand who greeted him rather rudely -- with an obscene gesture and beer thrown in his face. The Patriots, who won 43-40, didn't appreciate the actions of the beer-splattering fan. The team announced Monday that they have identified the fan and turned over that name to police. The matter has been turned over to local law enforcement and the fan will be sent a letter of disinvite to all future events at Gillette Stadium." Hill, who scored his third touchdown of the night on that play, said he wasn't crying over spilled beer. "My coach [Andy Reid] told me, ‘Don't get emotional. Don't get mad about it because it comes with the territory.' I'm not mad at all," Hill told reporters after the game. New York Jets: The team got a boost before their victory Sunday over Indianapolis when ailing defensive coordinator Kacy Rodgers made a pregame visit to the locker room at MetLife Stadium. Rodgers is fighting a serious undisclosed illness and watched the game but did not call the plays. The defense responded to his visit by intercepting quarterback Andrew Luck three times and recovering a fumble, which led to 20 points. "Just to see him walking is a blessing," cornerback Morris Claiborne said, according to NJ.com. "When he came in, you could feel the positive vibes that arrived with him. I was just trying to feed off of those vibes when I saw him, and take it on the field with me." On Monday, doctors cleared Rodgers to ease he way back into work.